This post reports on an international seminar sponsored by the Rockefeller Foundation in July, 2011 that brought together several of IMTFI's researchers with colleagues from around the world to discuss alternative banking and "social" inclusion. Often we read and research financial inclusion without reflecting enough on social justice and social welfare policies that may or may not accompany financial inclusion goals. This conference took up this issue. These ideas were first explored in 2006 at an international seminar in São Paulo and developed further at the 2009 Meeting of the Society for the Advancement of Social Economics in a session entitled “An Alternative Banking Business Model? Savings, Cooperative and Public Banks in the Current Financial Meltdown.” We have since worked with business and public policy schools and alternative bank groups and associations to build a network capable of launching new Core Principles for Alternative Banking and Social Inclusion. The July seminar confirmed the potential for new technologies at large alternative banking institutions in developing and emerging countries to accelerate social inclusion (and maintain it in advanced economies). Our IMTFI research on the modernization of a public savings bank and central banking in Brazil found that, in contexts of inequality and financial exclusion, positive sum relations between inclusion and optimal monetary policy obtain. This reverses the received wisdom of politics, money and central banking. Instead of seeking to ensure central bank independence from politics and social forces (and free markets and private banks through privatizations and deregulation), the construction of monetary authority in Brazil has involved the realization of competitive advantage by large public banks and new policies to include unbanked citizens (80 percent of Brazilians in 2000). Moreover, basic income policies (albeit conditional), other social services, and public banks have proved more successful than private banks for reaching the unbanked. Conceptions of citizenship and social justice have thus proved essential for financial inclusion and broadening the supply of banking products and services. These changes are profound and profoundly different than strategies past and present. Since the end of the electoral road to socialism exemplified by the military coup in Chile against President Allende on 11 September 1973, social scientists and policy communities have largely concurred that markets severely constrain social inclusion. Since the 1970s, social scientists have emphasized how markets cleared by individual investors impose fiscal austerity because social policies pressure fiscal accounts and lead either to tax increases or adjustment policies. This, in the worst cases, caused political and economic crises and the breakdown of democracy in developing countries. Similar forces in advanced economies are seen to have caused stagflation and electoral turns to neo-conservative governments and neo-liberal policies in the 1980s determined to downsize welfare states. These theories are now incomplete. Old views of fiscal dominance fail to capture the implications of advances in monetary economics during the 1990s and the expansion of monetary authority during the 2000s. New technologies, central bank modernization, new regulatory frameworks, and better supervision of banks and markets (contrary to deregulation in the US and a few tax havens and financial centers) provide a new setting for what we describe as financial roads to social economies. In other words, conceptions of vicious cycles that emphasize fiscal constraints predate studies of the credit channel and interest rate channel. These latter concepts from monetary economics have also informed central bank and money management since the late 1990s. While advanced economies currently struggle to emerge from crisis, the situation of many emerging and developing countries is different. Bank modernization, the accumulation of immense foreign reserves and the consolidation of reforms have approximated markets and government policy. We argue that new channels for change are therefore at hand. We focus on social banking, especially the ability of new technologies such as electronic card payment channels able to bring income grants and access to banking and public services in vast numbers. Since the adoption of new information and communication technologies by banks in Brazil, public policy and conceptions of citizenship and social justice have proved more important than expectations about non-governmental organizations, the competitiveness of private banks or the greater efficiency of market-centered microfinance firms or funds. Moreover, since liberalization of banking and finance in the 1990s, large public banks have remained dominant players in most developing and emerging economies, especially the largest ones. Instead of transitioning to private banking, public banks have modernized to remain central agents of credit, finance and public policy. The modernization and capitalization of large public banks during the 2000s proved just in time to provide policy makers with counter-cyclical instruments once the global financial crisis hit in 2008. Further research into this anomaly for mainstream theories of banking will be required. We focus on one dimension: How public savings banks provided new channels for social policies based on conceptions of citizenship and social justice. Two examples illustrate how inequality provides a different setting for money and finance. First, high financial returns and high inequality transform finance from a phenomenon that may smooth consumption and investment across social groups and generations into a significant causal factor in the reproduction and worsening of inequalities. Second, we estimate the time needed for Brazil to reach levels of bank inclusion common to advanced economies under four different policy frameworks. Existing frameworks based on private banking and capital markets fare the worst. The following figure projects 10 percent average financial returns from 2001-2040 based on income levels across population quintiles reported in the São Paulo Municipal Atlas. Data from 1991 and 2000 are averages from census data. The declines recorded for lower income quintiles 1991-2000 suggest the impact of economic reforms and migration from rural areas to urban areas during the 1990s. After 2000, we calculate hypothetical figures by adding 10 percent per year to each income quintile across decades (realistic given average financial returns in Brazil remain well above 10 percent). Note: Authors calculations based on quintiles and top 10 percent income as measured by municipal atlas (from IBGE data). 1991 and 2000 baselines assume average savings/assets for each quintile of one month income. Curves calculated on assumption of 10 percent annual financial returns. Finance thus increases inequality in a setting of high inequality and high financial returns. Indeed, given the inability of many citizens to save, and the reality that roughly 55 percent of Brazilians remain without bank accounts, this exercise underestimates the impact of finance on inequality. Given the notorious starting point of Gini Coefficients for Brazil in 1990 (0.60; one of the world´s worst), the gaping differences in the value of personal assets over time increase substantially. The geometric character of financial returns over time increases inequality. A second example suggests that private bank-based strategies are not sufficient to counter legacies of underdevelopment and exclusion. The following figure extrapolates the pace of bank inclusion achieved during 2000-10 for the decades 2010-30 with four hypothetical supply curve scenarios. At the current pace of inclusion according to a private bank supply curve, one can expect 50 percent or 150 million of 300 million Brazilians to have bank accounts by 2030. 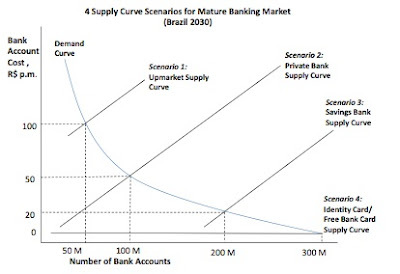 A second lower supply curve of savings banks that specialize in “no-cost no-questions-asked” accounts indicates that one can expect roughly 66 percent or 200 of 300 million Brazilians to have bank accounts by 2030. A more expensive upmarket supply curve of private banks implies that five percent or 60 million Brazilians would be included by 2030. Finally, a fourth scenario of identity card or free bank cards implies coverage of all, or virtually all, Brazilians by 2030. Given disappointments with market-based models and private bank microfinance strategies, we further explored alternatives through a case study of the Caixa Econômica Federal, a public savings bank. Previous research at the FGV-EAESP Center for Microfinance Studies explored bank strategies to reach outlying areas of the Amazon in Autazes and small towns of Center-West Brazil. However, we adopted a ‘worst-case study’ approach to examine banking in the far East End São Paulo district of Guaianases. Aggregate data from the Central Bank of Brazil, branch-specific data from the Caixa, and interviews explored which types of banking products and services seemed most effective in this district marked by inequality and poverty. Three findings stand out. First, the Caixa (Brazilian federal savings bank) provides different experiences with money, technology, and financial inclusion. This savings bank combines the universal reach of government public policies and core concepts such as citizenship with the large organizational scale and networks of branch offices and banking correspondents of Brazil’s fourth largest bank. This combination was key for accelerating access to social policy and banking, both in the geographical sense of reaching the vast interior of the country and in the social sense of reaching poor urban areas largely ignored by private banks. Second, this dual role of social policy agent and savings bank provides both the Caixa with competitive advantages, and political and social forces with policy options and resources. Caixa policies such as free accounts for Brazilian citizens, a wide network of correspondent banking institutions (over 34,000), and management of social policies (social security pensions (INSS), worker payroll savings funds (FGTS), unemployment insurance and PIS-PASEP savings funds) combine to provide scale, scope, tradition, confidence and trust –profound competitive advantages for the Caixa. Third, Caixa policies seek to transform family grants into simplified banking accounts and overdraft credit and savings accounts. This is a different route for financial inclusion via basic income policies, citizenship, social policy, and savings banks. Given the substantial increase of inequality and poverty during the 1990s (a period of economic adjustment and reform in Brazil) and problems abroad since 2007crisis, we believe that this “back to the future of social banking” experience may contribute to debates about what to do during and after crisis. Our IMTFI-funded research thus inspired us to work with institutional partners and public policy schools to encourage research on and discussion of alternative banks. Olivier Butzbach joined our efforts as co-convener of the July 2011 conference on Alternative Banking and Social Inclusion at the Rockefeller Foundation Bellagio Center. Participants confirmed that research in advanced and developing countries has found substantial evidence of the competitive advantages of cooperative and savings banks. Lauro Gonzalez (Director, FGV-EAESP Center for Microfinance Studies) emphasized the variety of different strategies in the public and private sector currently being explored in Brazil. Otaviano Canuto (World Bank VP & Head of Poverty Reduction and Economic Management Network) cautioned participants not to overestimate the importance of alternative banking given the accumulated experience with economic reforms and policies over the last decades. Olivier Butzbach (University of Naples II and King´s College London) focused on the modernization of savings and cooperative Banks in France, Italy and Spain. Laurence Roland, (Réseau Financement Alternatif or RFA) reviewed the coalition of social movements and non-governmental organizations working through RFA to improve Access to banking in Europe. Reinhard Schmidt (Goethe Universität, Frankfurt) reviewed the history and recent modernization of savings Banks in Germany and Austria, suggesting that the competitive advantages of traditional social banks have proved critical during and after crisis. Rob Grzywnski (Shorebank) reviewed the history of Shorebank in the United States as an alternative banking institution designed to promote development in redlined urban districts. Ian Callaghan and Laurie Spengler (Shorebank International) reviewed experiences at Shorebank International with joint ventures between social capital investors in advanced economies and alternative banking institutions in developing countries. Lakshmi Kumar (Institute for Financial Management and Research, Chennai) emphasized the large scale and diverse character of cooperative banks in India. Ranjith Hettiarachchi (CEO, Association of Asian Confederation of Credit Unions) emphasized the rapid growth of credit unions across Asia during the last decades and the importance of these institutions in promoting social inclusion and sustainable development. Conference participants debated the following principles for alternative banking and social inclusion. We currently seek to promote these core principles for adoption by international associations of savings and cooperative banks and domestic and international monetary authorities. The Bellagio Principles for Sustainable Development serve as a model for promotion of an agenda for the acceleration of social inclusion via alternative banking. Promote access to and use of banking and financial services by all through new technologies and distribution channels to capitalize assets among the poor. Provide basic income via ATM cards and mobile banking to reach the poor and open new channels of access to income, savings, credit, finance, insurance and opportunities. Alternative banking seeks to work within regulations, guidelines and best practices recommended by domestic monetary authorities and international regulatory institutions such as the Bank for International Settlement Basel III Capital Risk Guidelines. Integrate corporate social responsibility into down-market business strategies and institutions of representation and democratization. Publish annual reports and balance sheets in accord with international best practices of financial, social and sustainability reporting. Use competitive advantages in banking and institutional networks to channel more effectively capital, income and finance to the poor. Use branch offices and new banking technologies to accelerate progress toward UN millennium goals to eliminate poverty. Promote financial education to encourage responsible banking and finance and avert predatory lending and unethical practices. Incorporate electronic card and mobile banking services to better serve the poor. Promote alternative banking and business practices that contribute to environmentally sustainable income, consumption and production as stated in Bellagio Principles for Sustainability. Instead of a single model, alternative banking institutions and international agents may best accelerate social inclusion by respecting different contexts, averting single models and working with existing social and political forces to innovate.